Leaving Pinedale Wyoming it was on to Green River Utah. However, we had to make a stop in Green River Wyoming. Les was noticing oil coming out that shouldn’t be so we made a stop Flaming Gorge Harley Davidson. They were great!!! Les used his handy dandy factory HD GPS that took us right there. I wasn’t allowed to park in front of the store because I was on a “not a Harley”…Ok, just kidding, they were great people. The service manager came out to the parking lot, checked over Les’ bike and told him not to worry, it’s just blow by. I convinced Les that he had to buy a T-Shirt from them and he did. Back on the road. 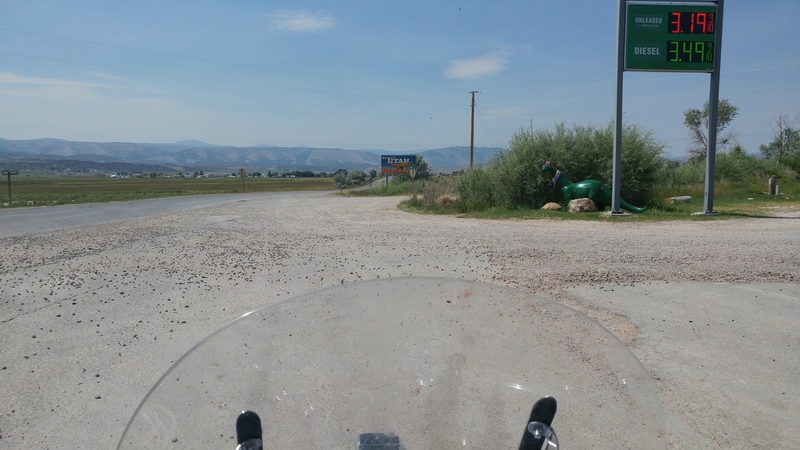 The Ride to Green River was great…uneventful but great. Wide open spaces easy roads and you guessed it…Triple digit speeds. The Roadliner is wonderful at speed, it can pass almost anything but a gas station. And speaking of gas stations…here we are at the border and we ran into (not literally) a couple who was traveling, and get this, from Atlanta Georgia to British Columbia and back!!! Les is really good at making friends and these folks were great. The lady had the worst case of “Raccoon Eyes” I’ve seen since my skiing days! From here it was onto the Motel 6 in Green river Utah. A pretty easy 400 mile day When we got to town it was smaller than small, but…the motel was just fine, met a really nice couple and their dog out in this area for some dirt bike riding…yes, the Dog did ride. The restaurant next door was really good, almost as good as the view. Next morning The Grand Escalante Staircase and end the day in Kanab, Utah.